However, I'm looking at a certain team 22 miles away from Gillette, and month and a day from beginning it's season. They had a key player (some say the best player on the team - I'm not so sure) knocked out early in the season. Granted, that one was from a dirty hit and a half, and damn near killed him. 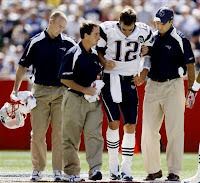 Brady walked off the field. Regardless, it was a huge hit to the Bs season last year, though people were saying that Boston would be last in the East last year. They were of course proven wrong, and it was quite exciting. Well, for me, at least. Better luck next year, Buffalo. You should've taken your stacked team from two years ago through everything. Should fit right in with the rest of the Big Bad Bruins. I'm started to get pumped for not just Hockey coming back, but the Bruins coming back. Training camp is coming....who among you will I be seeing at the rink on Saturday the 20th?